The four terraced homes in the Scanlan Lofts development each have their bedrooms on the mid-level, with the generous living spaces above. Architect Paul Leuschke says he drew inspiration for the wider interiors from the edgy, iconic New York loft style. “The base palette is very simple – wide-plank wood floors and white walls, with metal mesh screens and raw, blackened metal staircases and fireplaces providing the industrial highlights,” Leuschke says. 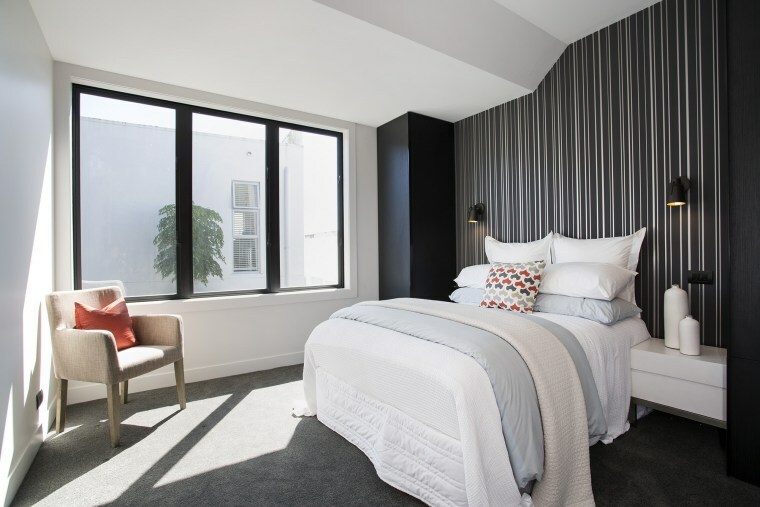 However, interior designer and project developer Joycelyne Ghee of Phi Group says she wanted to find an easy balance between the semi-industrial aesthetic and a softer, more refined look for the bedrooms. “To achieve this, we specified a Resene wallpaper, Masterpiece, as an accent wall for some bedrooms. This strikes a happy medium between a classy ambience and the New York-chic aesthetic. ”Resene wallpapers present an easy way to dress up your walls or, as in this case, provide a strategic accent wall. Options include everything from classic designs like Masterpiece to exotic florals and textural styles such as Rattan or Driftwood, as well as trending photo-realistic wallpapers.